I am running ArcGIS 10.1 with 64-bit GP on Windows 8.1 x64. The code for performing ZS one polygon at a time is posted below, however the tool only completes about one parcel every minute. I'm wondering if anyone has any insight on how to improve zonal statistics performance or the script in general. b = gdb + "\\" + "ParcelBuffers"
kd = gdb + "\\" + "kdensity750"
parcel_ram = "in_memory" + "\\" + "parcel"
zs_table = results + "\\" + "zs_table_" + str(PIN) + ".dbf"
solution = results + "\\" + "ZS_solutions.txt"
mapDocument = env.workspace + "\\" + "ClusterAnalysis.mxd"
raster = env.workspace + "\\" + "ClusterAnalysis.gdb\intKD750"
rast = env.workspace + "\\" + "ClusterAnalysis.gdb\parcelRaster"
Create fishnet - polygons with extent=extent of overlapping polygons. Calculate field ID = FID. Spatial join overlapping polygons with fishnet polygons using HAVE_THEIR_CENTER_IN. Use Minimum Bounding geometry on step 3 output. Change the name of raster to sample. minBound is used to browse area of interest and narrow processing extent and number of polygons to process at a time, by modifuing parentLR definition query. Critical part is selecting non-overlapping groups of polygons, accomplished by analysis of spatial join table with ONE_TO_MANY option and modifying definition query of parentLR. Performance more than 2000 polygons per minute, thus less than 2 days to process 4.7 millin polygons:). Windows 7, RAM 8 GB, 64 bit. Correct. This might be even faster. 1st layer - fishnet. Set env.extent=parentLR.extent just before zonal statistics. All this to make task of ZS easier, so it works on a tiny subset of raster. Felix, I have one more question regarding your script. The parID field is for identifying the parentLR data set (polygons spatially joined with fishnet grids), but I'm not sure what the data/field the parID2 variable is referring to. I also believe that this script will overwrite the DBF table being output. At the moment I am pre-processing the data required for the script, but any clarification on these variables would be welcome. Thank you. Yes, DBF is replaced all the times, but it has all the records required to updated hugely 'thinned'parent layer. I've almost fully replicated your workflow however the zonal statistics tool gets an error that is unrelated to the topic at hand. Error 010423: help.arcgis.com/EN/arcgisdesktop/10.0/help/index.html#//… I have checked that the value raster meets the conditions for the zonal statistics tool however the selected parentLR records are questionable. I think the script solves the problem I posted about but I would like to post a commented and updated copy for future users. Hi Felix, I've posed an update to my testing in my original post above. Thanks for your help. Given the magnitude of the problem, I doubt there is any chance this will work. Have you tested it on any datasets? How about on datasets this large? Thank you--it is very good to read about your own experience because it lends credibility to your proposal. In re-reading the question it appears to me that the OP has actually tried these techniques of breaking the problem into smaller ones and found them wanting with his/her data, but "none of these implementations perform adequately." Felix, the study area of the kernel density raster is quite large and would require about ~4 billion points to represent as a vector. I don't think this would simplify the workflow. It is an interesting suggestion though. Guys, I am withdrawing my suggestion,sorry. I ran a test at home using 30 000 overlapping polygons and 7000*7000 raster. Did all the possible improvements, working with GRID (not FGDB), shapefiles (not FC in FGDB), dictionaries (not build-in statistics). Managed to achieve 100 polygons/minute only. Yes, out of date slow PC and still 100/m is not fast enough. I am thinking of 1) creating not overlapping polygons, 2) one to many spatial join with parents 3)merging bits statistics (no SD though). I like 'smart' slicing polygons though created in the process. 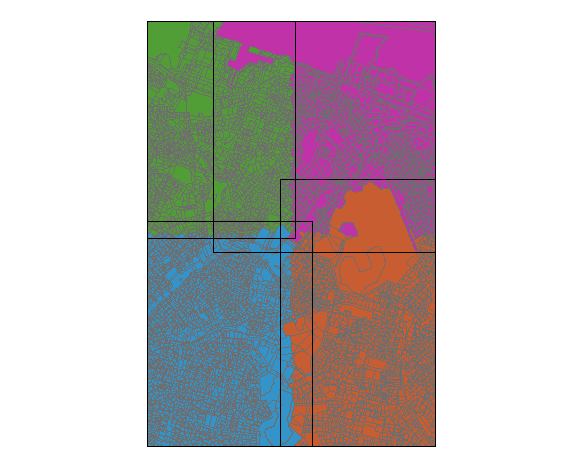 [SOLVED] Performing overlapping zonal statistics in ArcGIS?